We Offer Free Collection and Delivery, Click Here for More Information. During the Christmas period, it is sometimes nice to wear a Novelty Christmas jumper, but it is not nice to have to buy new ones every year due to the material being damaged or the decorations have fallen off it! Whereas if you dry clean your jumpers instead of putting them in the washing machine, then you could be saving yourself money! With our Dry Cleaners in Milton Keynes, you are guaranteed to be helping yourself, as well as the environment and charity! Dry cleaning is the process to clean items without using water and replacing the water with chemical products. Here at Eco Clean MK, our cleaning products are economically friendly to ensure that there is no harm to the environment during this process, or any damage comes to the items. Most Christmas jumpers have extras to make them look more quirky, usually pom poms or extra bits of material coming off the jumper. These can be easy to fall off as they are either held on my wool or fabric glue. Here at Eco Clean MK, we can fix your novelty jumpers if parts have fell of them, or if they have torn. Saves you the hassle of buying a new Christmas jumper every year! Christmas jumpers are usually £15+ each, which can add up to quite a lot if you have a whole family who need new jumpers every year. 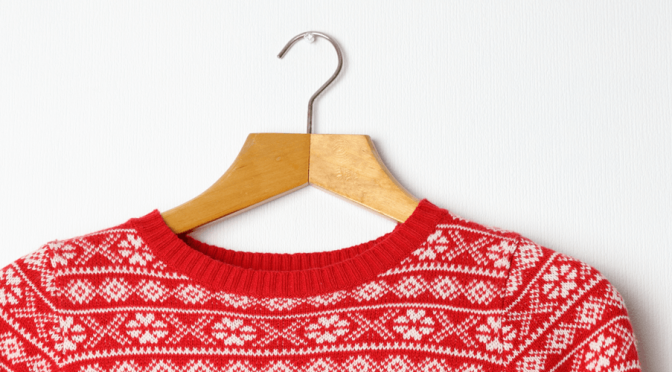 Our dry cleaning prices start from just £3.50, meaning that we can defiantly save you money if you decide to get your Christmas novelty jumpers with our Dry Cleaners in Milton Keynes. Here at Eco Clean MK, each month we donate 5% of all of our earnings to charity. This means that the more times you use our services, the more you are helping charity. As well as helping the environment, due to our eco-friendly products.